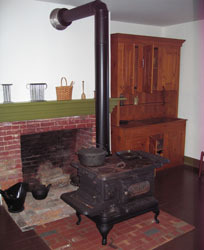 Learn about Kansas City area history and stay for lunch prepared on the wood stove. Join us from 11 a.m. – 1 p.m. January 11 as Dr. Brice Obermyer, associate professor of anthropology at Emporia State University, presents information on the Delaware Indians. Admission is $5 adults, $3 children age 12 and younger, and includes a tour of Grinter Place and lunch. Explore rooms decorated with period furnishings, the Grinter family Bibles and photos, and a quilt made by Anna Grinter. Take in a view overlooking the Kansas River when you step out onto the second floor balcony. Discover the way of life experienced by families living on the frontier. A trip to Grinter Place isn’t just a look inside the oldest home in Wyandotte County, it’s a step back to the days of frontier life along the Kansas and Missouri borders. Overlooking the historic Delaware Crossing on the Kansas River, Grinter Place was the home to Annie and Moses Grinter. Annie, a Lenape (Delaware), helped farm, raise poultry and livestock, and plant an apple orchard. Moses operated a ferry and a trading post, where he traded with the Lenape. Learn how life in Kansas changed dramatically through the stories of Annie and Moses when you visit the stately Grinter Place. Consider this for the Our Heritage and Native American badges. Have you ever wanted to travel back in time and pretend you lived long ago? Well now’s your chance! Come spend a Saturday morning at the Shawnee Town museum experiencing life in 1920s Shawnee which was the center of the truck farming economy. Come help us plant and harvest 1920s heirloom crops. Do laundry with a washboard and hang it on the line to dry. Churn ice cream and taste the goodness of your hard work. Meet Romeo and the ladies in our chicken coop. Listen to some of that ol’ time music and have yourself a picnic on the grounds. Mail a postcard with postage “on us” telling friends and family about your good time. Every Saturday brings surprises. You never know what you’ll find happening in Shawnee Town 1929. Saturday, July 6, 13, 20, and 27, 10:00 a.m. – 12:00 p.m.
For more information, including admission rates, visit the Shawnee Town website. Bring the family out to enjoy living history activities at Mahaffie Stagecoach Stop and Farm. Admission is free, though there may be a small fee for certain activities, and stagecoach rides are $2/person. Thursdays in June and July, 6:00 – 8:00 p.m.
1200 Kansas City Road, Olathe, Kansas. Mahaffie is always a good source for Our Heritage activities. Saturday, June 15 or 29, 10:00 a.m. – 12:00 p.m. Explore the 1830’s wagon ruts left by Santa Fe Trail caravans, enjoy a wagon tour highlighting some of the history of Independence, and examine artifacts related to the Santa Fe Trail in the exhibit gallery to understand the importance of this international trail of commerce and military. Learn more about the museum and other things to see in Independence on the Independence website.